Melissa Carroll graduated from the French Culinary Institute in Campbell, California in 2012, before returning to her hometown in O'Fallon, Illinois to work at London Tea Room in downtown St. Louis, Missouri. Her first experience in a professional kitchen, she was named Pastry Chef and led a team of three cooks. She finished her Fine Art degree at Southwestern Illinois College and continued her foray into the culinary world at Peel Wood Fired Pizza in her hometown. 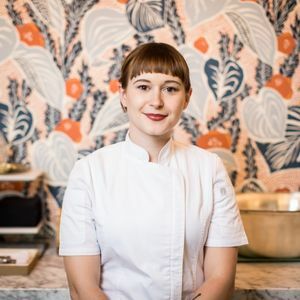 In 2015, Carroll moved to Austin and soon joined the New Waterloo team as a pastry cook at South Congress Hotel under Corporate Executive Pastry Chef Amanda Rockman, a James Beard Foundation Award Semifinalist. Carroll was promoted to Pastry Kitchen Supervisor in December 2016 before transferring to Le Politique in August 2017, where she served as opening Pastry Sous Chef under Alyssa Hurlstone. Carroll was promoted to Pastry Chef of Le Politique in May 2018, overseeing the restaurant’s pastry program and adjoining patisserie. Since coming into her position, she has been nominated for Austin Chronicle's Best Pastry Chef of Austin 2018 and 2019 CultureMap Tastemaker Awards Pastry Chef of the Year. She enjoys striking a balance between sweet and salty flavor profiles in her dishes, and is always seeking the next unique flavor combination that hasn’t been done before.